Today's big bad Facebook revelation is a search engine—not for the web, but for your entire life. And it's just another step in Facebook's attempt to conquer the entire Internet. This is Graph Search. Facebook's search has been convoluted and weak for years until now—it's hard to expect what you get when you type anything in, even if it's your best friend's name. People, pages, maybe places. Boring and often broken. But with today's search monster, Zuckerberg isn't just offering you a way to find your friends (or college frenemies). And it's beyond just some attempt at a Google replacement. It's an attempt to do what Google failed at doing—pulling all the information that matters to you within the context of your social life, skipping the results that are popular to The Internet, in favor of the results that are popular within a group you actually give a damn about. Not a horde of strangers. Everyone you know uses Facebook, and now those people are going to work for you when you search. Graph Search doesn't replace the current Facebook search, but offers a massively expanded new way to explore your web social life. Photos, places, interests, and of course, people can all be cataloged and called up instantly. For example: searching for a sushi restaurant won't just bring up a well-linked list a la Google. Instead, your restaurant query will be answered with a little help from your friends, presenting you with suggestions based on where your relations have checked in. Eventually, Graph Search will scan the kind of words they've used to describe the place (favorable or unfavorable), but for now the Like is the biggest indicator that you should check this place out. But this isn't just food! If you're looking for music, the recent selections of your pals will inform the results. For any occasion, the answer doesn't lie with some invisible algorithm pointed out toward the web void, but at the people you know, who are doing or have done the thing you're talking about. Your friends' experiences will give you answers to what you're wondering. At least that's the idea. And if it works, we'll have a reason to skip opening a new tab headed to Google.com—an enormous victory for Facebook, and a profound change in how we all use the Internet every single day. So how does Graph Search work? Graph Search (currently in beta, rolling out "slowly") is a live, constantly updating list of results, triggered from a nice thick search box at the top left of the page. It changes as you type, a la Google's autocomplete queries. Anything that can't be found inside Facebook's social storehouse will be outsourced to Bing. As you start typing, say, "photos of my friends," results will pop up. If you add "taken in 2008," you'll get those photos. Searches are built using simple, natural language searches. "Friends who like Star Wars and Harry Potter." "What music do my friends like?" Even more complicated questions, like "People named Brian who went to Princeton and like Star Wars." Or hey, even "Friends of friends who are single and like Game of Thrones." Boom—time to start flirting. Or poking. Sadly, information from titan apps like Instagram and Spotify aren't included—and when you're searching for music, that hole is particularly large. But remember: this thing's in beta. Graph Search also completely geographically aware, so if you're a college sophomore looking to branch out, you can see if you have any mutual friends at a nearby school who share some hobbies with you. Instant results, with faces to put to names—but this action is only as good as the extent to which your crew uses Facebook instead of Foursquare. Search is also deeply graphical—and looks like the easiest way to navigate Facebook photos we've ever had. "Photos of my friends." "Photos of my friends in Tokyo." "Photos I've liked"—yep, you'll be able to instantly pull up all the photos you've given the thumbs up to for the entirety of your time on the social network. It's revelatory, and wonderfully nostalgic. Graph Search seeks answers incredibly fast, and allows for the kind of spastic hopping around that's become natural on Facebook. Every piece of data you share on Facebook, now searchable, will be privacy aware—meaning it's only available to the friends you want it to be available to, not the web. You won't be dumped into some Internet database. If you want to filter parts of your life out of Graph Search, you can do that with the newly-expanded privacy controls Facebook rolled out last month. Facebook is even going to prompt you to review everything you've shared before Graph Search launches, meaning you'll be able to sweep undesirable photos (or interests—you liked Two and A Half Men?) under the query rug. 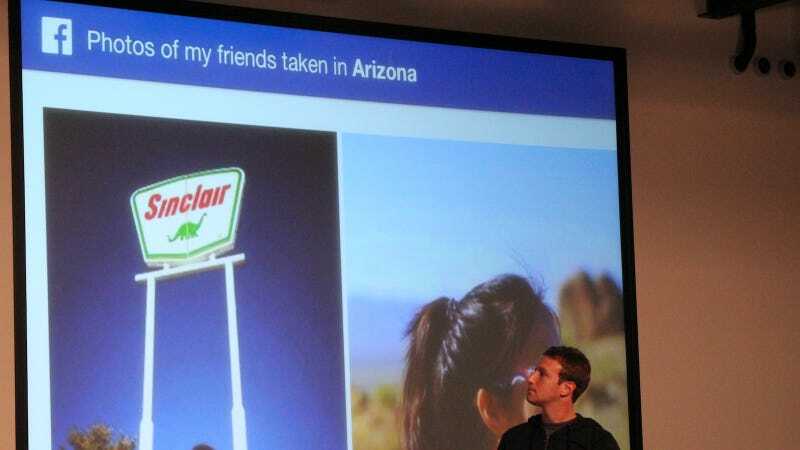 And Zuckerberg assures us: nothing you weren't sharing before will be newly shared through Graph Search. But that doesn't mean it won't be a hell of a lot easier to find. Graph Search isn't done. You can't search all of the bazillion posts you and your friends have written, it's not available on mobile, and there are still enormous parts of Facebook that haven't been mapped yet. But that'll come—as will ads in this thing, of course. It's also got a pretty large authority problem. Unless your friends are pouring opinion and activity into Facebook, searching can feel hollow. And until Facebook starts incentivizing that kind of annotation—or making it uncomfortable not to—search will continue to feel kind of vacant at times. So we're going to have to pick between two compromises: a superflux of data from Google, much of it authoritative, but innumerable, or the weaker words of our friends. It's not hard to imagine where this search points: every app, every service, every sentence you've ever connected to Facebook, instantly rerouted into your eyeballs. This is just the beginning, but even the beginning is sort of overwhelming.